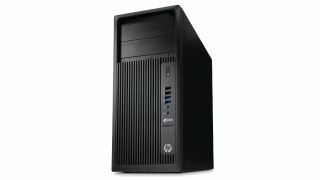 HP has revealed the third-generation of its Z240 workstation, which is aimed at SMBs and boasts a major jump in performance. The new relatively compact PCs can be specified with an Intel CPU running at up to 4.2GHz, and up to 64GB of DDR4 ECC memory (in other words, you can fit twice as much system RAM compared to its predecessor workstation). Nvidia or AMD graphics can be specified, and you get a built-in M.2 slot for expansion cards, with HP noting that this frees up a PCIe slot – which can then be used for an HP Z Turbo Drive (optionally, two of these SSDs can be included on board). On the operating system front, you can either go with Windows 7 or Windows 10, or for those who prefer the non-Microsoft route, Linux can be installed. Josh Peterson, vice president, global product management for workstations at HP, commented: "The Z240 is ideal for customers in the video editing, product design, architecture, engineering, education, public sector and image-viewing industries." The machine is also fully ISV-certified, and Peterson added: "The 368,000 hours of gruelling quality testing and ISV certification means the HP Z240 is designed as a long-term budget friendly solution." There are some neat extras touches here as well, such as optional dust filters to help keep the innards of this PC from being clogged up with dust particles and the like, and also you can specify carrying handles to make this workstation more easily portable. Finally, the Z240 comes with an integrated HP Remote Graphics Software receiver, which allows for an easy and secure remote hook-up between the workstation and a Mac or MacBook for sharing and using apps across these platforms. HP says that prices will start from just under $900 (around £685, AU$1,195).